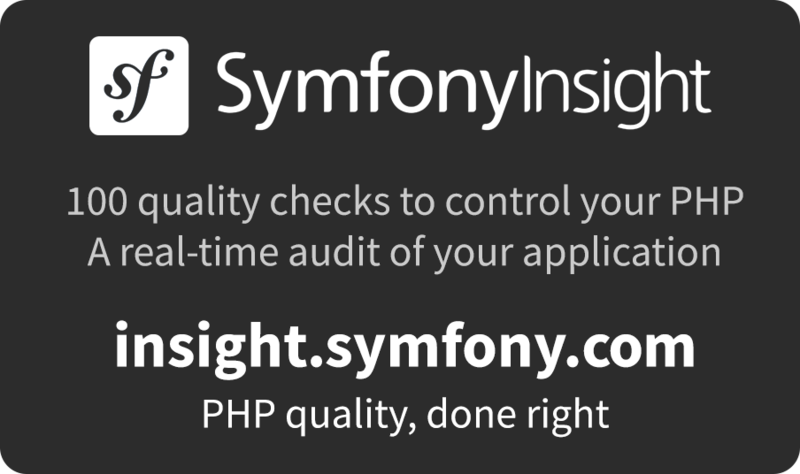 Symfony Components are a set of decoupled and reusable PHP libraries. They are becoming the standard foundation on which the best PHP applications are built on. 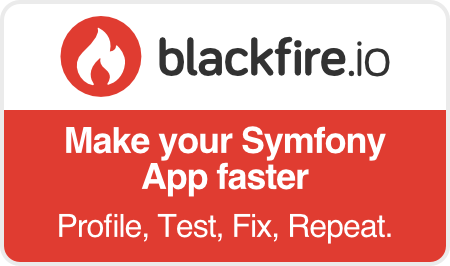 You can use any of these components in your own applications independently from the Symfony Framework. BrowserKit Simulates the behavior of a web browser. ClassLoader Loads your project classes automatically if they follow some standard PHP conventions. Config Helps you find, load, combine, autofill and validate configuration values. Console Eases the creation of beautiful and testable command line interfaces. Contracts A set of abstractions extracted out of the Symfony components. CssSelector Converts CSS selectors to XPath expressions. Debug Provides tools to ease debugging PHP code. DependencyInjection Allows you to standardize and centralize the way objects are constructed in your application. DomCrawler Eases DOM navigation for HTML and XML documents. Dotenv Parses .env files to make environment variables stored in them accessible via getenv(), $_ENV or $_SERVER. EventDispatcher Implements the Mediator pattern in a simple and effective way to make projects truly extensible. ExpressionLanguage Provides an engine that can compile and evaluate expressions. Filesystem Provides basic utilities for the filesystem. Finder Finds files and directories via an intuitive fluent interface. Form Provides tools to easy creating, processing and reusing HTML forms. Guard Brings many layers of authentication together, making it much easier to create complex authentication systems where you have total control. HttpClient A low-level HTTP client with support for both PHP stream wrappers and cURL. It also provides utilities to consume APIs. HttpFoundation Defines an object-oriented layer for the HTTP specification. HttpKernel Provides the building blocks to create flexible and fast HTTP-based frameworks. Icu Contains the data of the ICU library in a specific version. This component is deprecated since October 2014, use the Intl component instead. Inflector Converts English words between their singular and plural forms. Intl Provides fallback code to handle cases when the intl extension is missing. Ldap Provides an LDAP client for PHP on top of PHP's ldap extension. Locale Provides fallback code to handle cases when the intl extension is missing. This component is deprecated since 2.3, use the Intl component instead. Lock Creates and manages locks, a mechanism to provide exclusive access to a shared resource. Mailer Helps sending emails and provides integration with the most popular mailing services. Messenger Helps applications send and receive messages to/from other applications or via message queues. Mime Allows manipulating MIME messages, used to create advanced email messages. OptionsResolver Helps you configuring objects with option arrays. PHPUnit Bridge Provides utilities to report legacy tests and usage of deprecated code and a helper for time-sensitive tests. Polyfill APCu Provides apcu_* functions and the APCUIterator class to users of the legacy APC extension. Polyfill Ctype Provides a partial, native PHP implementation for the ctype extension. Polyfill Iconv Provides a native PHP implementation of the php.net/iconv functions. Polyfill Intl Grapheme Provides a partial, native PHP implementation of the Grapheme functions from the Intl extension. Polyfill Intl ICU Provides a collection of functions/classes using the symfony/intl package when the Intl extension is not installed. Polyfill Intl IDN Provides a collection of functions related to IDN when the Intl extension is not installed. Polyfill Intl MessageFormatter Provides a fallback implementation for the MessageFormatter class provided by the Intl extension. Polyfill Intl Normalizer Provides a fallback implementation for the Normalizer class provided by the Intl extension. Polyfill Mbstring Provides a partial, native PHP implementation for the Mbstring extension. Polyfill PHP 5.4 Provides functions unavailable in releases prior to PHP 5.4. Polyfill PHP 5.5 Provides functions unavailable in releases prior to PHP 5.5. Polyfill PHP 5.6 Provides functions unavailable in releases prior to PHP 5.6. Polyfill PHP 7.0 Provides functions unavailable in releases prior to PHP 7.0. Polyfill PHP 7.1 Provides functions unavailable in releases prior to PHP 7.1. Polyfill PHP 7.2 Provides functions unavailable in releases prior to PHP 7.2. Polyfill PHP 7.3 Provides functions unavailable in releases prior to PHP 7.3. Polyfill Util Provides binary-safe string functions, using the mbstring extension when available. Polyfill Xml Provides a fallback implementation for the following functions in the abscense of the XML extension. Process Executes commands in sub-processes. PropertyAccess Provides function to read and write from/to an object or array using a simple string notation. Routing Maps an HTTP request to a set of configuration variables. Security Provides an infrastructure for sophisticated authorization systems. Serializer Turns objects into a specific format (XML, JSON, Yaml, ...) and the other way around. Stopwatch Provides a way to profile code. Translation Provides tools to internationalize your application. Validator Provides tools to validate classes. VarDumper Provides mechanisms for walking through any arbitrary PHP variable. VarExporter Exports any serializable PHP data structure to plain PHP code and allows to instantiate and populate objects without calling their constructors. WebLink Implements HTML5 Links, Preload and Resource Hints specifications to advise clients (browsers) to preload and prefetch documents through HTTP and HTTP/2 pushes. Workflow Provides tools for managing a workflow or finite state machine. Yaml Loads and dumps YAML files.